Tony Hill is either a misunderstood genius or an absolute crackpot. And even after digesting the weighty 18 songs on the Hartford, Vt.-based songwriter’s sophomore album, And the Low End of High Art, listeners will be hard pressed to reach a definitive conclusion either way. Hill delivers the album’s opening salvo breathlessly repeating the phrase, “Hangin’ on and in, I’m hangin’, hangin’ on and in,” the harried urgency in his reedy baritone punctuated by strummed acoustic sustains. As the song settles into a vigorous country bounce, he seems flushed with frantic energy, gnawing lyrical chestnuts like a rabid squirrel — fascinating, but you want to keep your distance. That song, “Hangin’ On and In,” sparked the entire suite of material on Low End. Hill claims each song was written, rehearsed and recorded in an average of two or three days. The frenetic creative pace lends the album a certain rough-hewn, conversational immediacy. This aesthetic can be an asset, particularly given Hill’s evident affinity for blue-collar bards Springsteen, Petty and Dylan. However, at times the songs suffer intellectual imbalance, and Hill’s attempts at profundity devolve into limp platitudes. Case in point: “Reunion.” In a way, the song is a marvel. If we could believe it was a dusty folk-rock satire, it would be nothing short of brilliant. Outlining the reasons he’s choosing not to attend an upcoming high school reunion, Hill touches on one freewheelin’ cliché after another, clumsily taping them together like pages torn from a rhyming dictionary. At the song’s conclusion, he offers, “I once shared a kiss with a girl I knew / We’re all grown up, tell me, how are you? / You got a family of your own, you’re doin’ fine / I’m content … to just ride,” repeating the last three words ad nauseam as he presumably trails off into the sunset. But despite such cringeworthy moments, in others Hill is compelling. On the rambling “My Hometown,” he wields plainspoken lyrics with brash, almost unhinged authority, like a backcountry Beat poet. On the talking-country ballad “Die With the Shame,” the contrast between vintage barroom saunter and Hill’s brutal, unflinching musings evokes Ween’s bizarro country forays — if aided by whiskey and downers, perhaps. Marching rocker “Don’t Tell Me” is both clever and bruising. Although scattered and inconsistent, And the Low End of High Art proves there’s a method in Tony Hill’s madness. The fleeting moments in which he harnesses that madness are truly something to behold. 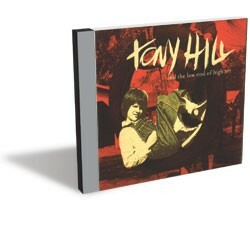 For more on Tony Hill, visit myspace.com/lofitonyhill.